bookofjoe: What is the most frequently mispronounced word in the English language? 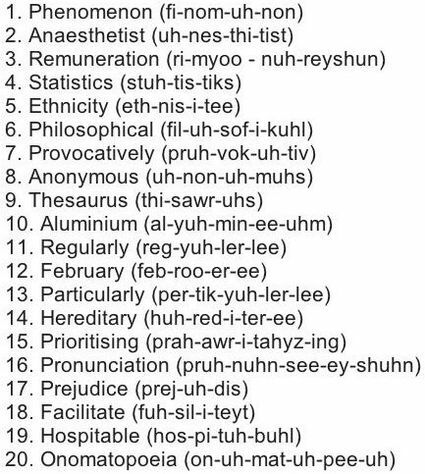 What is the most frequently mispronounced word in the English language? Above, the top 20, with phenomenon the winner. I wonder how the U.S. iteration — anesthesiologist — might've placed. Wouldn't be surprised if the three additional syllables were enough to put it over the top and trump phenomenon. So... Is this English from the U.K., Canada, or the U.S. ? Because I once spoke with a man from Liverpool, and I couldn't understand a word he said. Same with the word "aunt"... is it pronounced "ant" or "ont"
Why does the word "assignment" have 2 's''s, when the word "alignment" has only one 'l'? English is my first language, and there are way too many rules to it for any one person to remember them all. I am surprised at the number 1 since the entirety of the US mispronounces aluminium. The pronunciation for provocatively isn't even correct!